One of the most popular images of Hindu god Shiva is that of him sitting on a tiger skin. Another popular image is that of him wearing a tiger skin or he walks with a tiger skin wrapped around him. Symbolically, the tiger skin suggests that Shiva is the controller of all powers in the world. There is an interesting story in the Shiva Puran that mentions how Shiva came to sit on a tiger skin or why he wears it. 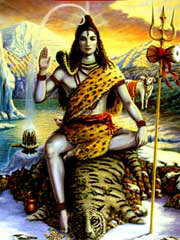 Shiva used to wander around the world as a bare-bodied sage. Once he reached a forest which was home to several powerful saints. The saints lived there with their wives in their ashrams. The wives of the saints were attracted to the young bare-bodied Shiva – although he remained unaware of their presence. But the wives could not concentrate on their daily routine and this led to many miss-happenings in the ashrams. When the saints realized that the reason for the waywardness of their wives was the young bare-bodied sage, they decided to teach him a lesson. The saints dug a huge pit on the way through which Shiva used to walk. When Shiva reached the pit, they used all their powers and created a tiger and released it from the pit. But without any difficulty, Shiva killed the tiger and tore off its skin and draped it over his body. The saints soon realized that one who could easily conquer over their powers was no ordinary sage and fell on his feet. Shiva then appeared before them with tiger skin wrapped around him. Since then he wears the tiger skin, which symbolically shows that he is the all powerful.